MBPC knows that to advance policies we need to get accurate and timely information into the right hands. We strive to serve as a resource to advocates, policymakers, individuals, and members of the press. To access a full list of MBPC’s independent research and reports, click here. To see a list of state and federal research and data resources, click here. To read MBPC’s fact sheets on a range of policies, click here. To view videos from MBPC, click here. To view our Interactive Housing Map, click here. 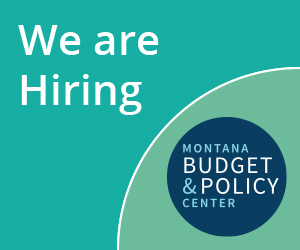 If you have any questions about our research or to get a quote from an MBPC staff member, please contact Tara Jensen, Co-Director of Public Affairs at 406-422-5848. Follow us on Facebook and Twitter (@MontanaBudget).